For the past decade, HEEDS design space exploration software and consulting services from Siemens has helped automotive engineers discover innovative, improved designs faster, and with reduced material and manufacturing costs. Faster development time translates into a shorter time-to-market, giving our customers and clients a competitive advantage. EDAG, Inc. is an engineering partner to the international mobility industry. The company develops completemodules, vehicles and derivatives, and it provides model building, prototype construction, and tool and body manufacturing. With its subsidiary, EDAG Production Solutions, the company offers vehicle engineering and development of production plants and factory concepts. In addition to providing engineering services, EDAG implements turn-key production facilities for body-in-white and vehicle assembly plants. 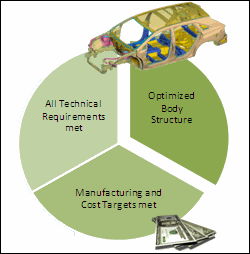 EDAG was recently faced with the challenge of minimizing the body-in-white weight of a vehicle while maintaining manufacturability and performance, and minimizing any increase in cost. Prior to the company's adoption of HEEDS MDO, EDAG could not solve a complex optimization problem like this one, which involved 484 variables. After 64 evaluations, HEEDS MDO identified a design that provided an 18% reduction in weight with a < 5% increase in cost. HEEDS allowed us to meet DFSS deliverables in record time. 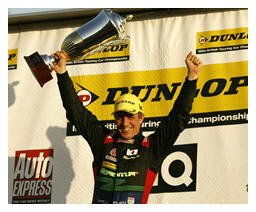 The technology partnership between Red Cedar Technology and its UK distributor, Zouch Dynamics Ltd., has helped Triple Eight Race Engineering and the MG KX Momentum Racing team achieve a first place race finish during the inaugural weekend of the 2012 Dunlop MSA British Touring Car Championship (BTCC) season. Zouch Dynamics used VI-Motorsport vehicle simulation software (developed by VI-grade) to create an accurate model of the MG6 BTCC car, which could be used to predict the vehicle dynamics of the actual MG6. This model was then used in conjunction with HEEDS MDO design optimization software to evaluate the performance of the MG6 BTCC car and find the setup that gave the shortest lap time. This setup helped MG KX Momentum driver, Jason Plato, place fourth and third in early races, and then finish first in the final race of the weekend. One of the reasons the car has been so fast, so quickly, and with such limited testing is the setup direction the team received from the HEEDS MDO / VI-Motorsport optimization.